Recent history, notably the diplomatic fracas surrounding the Iraq war in 2003 and continued cultural nationalism on the part of French elites faced with the English language and American mass culture, has tended to put forth notions of ‘France’ and ‘America’ as antithetical. This book seeks to break these paradigms, and to speak of entwined cultures and histories, promoting diasporic notions of Frenchness. 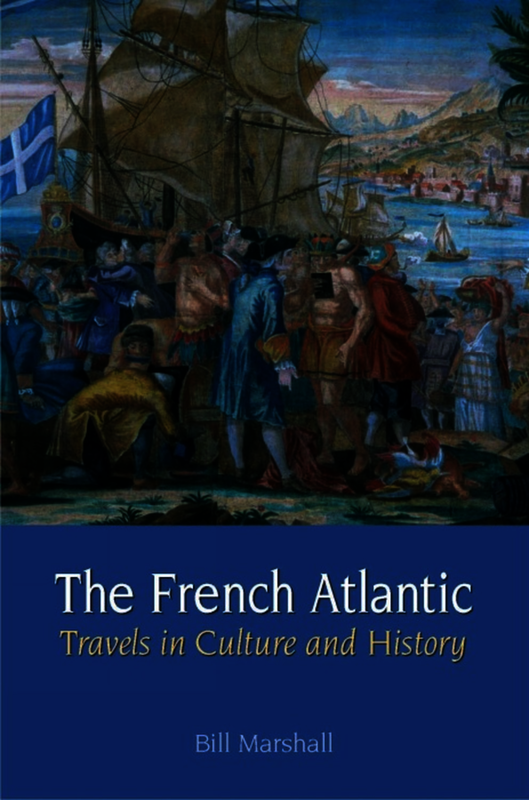 The French Atlantic: Travels in Culture and History, is an attempt to intervene in these debates and paradigms in the French and American public spheres, and in university disciplines, particularly in French studies, but also has relevance for American studies, comparative literature, film and cultural studies, history, Iberian and Latin-American Studies, and postcolonial studies. After a theoretical introduction, it explores the cultural history of seven different French Atlantic spaces, all the time attentive to the material determinants of their existence in the Atlantic world. Two are in metropolitan France, one is a French North Atlantic territory, one is in Quebec, one in the United States/northern Caribbean, one in the southern Caribbean/South America, and one in Latin America. A challenging but worthwhile book -- those patient enough to wade through it will be rewarded. Indexed, with extensive notes, good bibliography, and fine colored illustrations. It is the level of sheer interest aroused by Marshall's descriptions — particularly of previously underdocumented areas such as the very significant French immigration to Uruguay, the role of Saint-Pierre et Miquelon during prohibition in the USA, or the interaction between slaves and French convicts in Cayenne — that fully vindicates the book's commitment to opening up a new perspective both on the French Atlantic and on cultural history more generally. In The French Atlantic: Travels in Culture and History, Bill Marshall has produced a truly original and very engaging book that will be of great interest to readers in French, Francophone, and Atlantic Studies. This study is unique, quirky, and stimulating. ...this study combines geography, history, demographics, language, culture, literature and film to provide a unique perspective on the ways in which francophonie has been constituted in difference outside the French mainland. It deserves a place wherever ‘French Studies’ is taught or archived. The French Atlantic: Travels in Culture and History is nonetheless a fascinating and thorough exploration of key identities and spaces within the French Atlantic. This compelling book is a timely addition to the growing corpus of schol­arship on the cultural links between France and America ...Bill Marshall's The French Atlantic is a very impressive achievement. Its sheer richness - which of course cannot be fully conveyed here - forces us to rethink the boundaries between French, Francophone, African and American cultures. It is an indispensable book. Bill Marshall is Professor of Modern French Literature at the University of Stirling. Previous books include André Téchiné (Manchester University Press, 2007) France and the Americas (editor, Oxford & Santa Barbara: ABC-Clio, 2005), 3 vols. Musicals – Hollywood and Beyond (co-edited with R.Stilwell, Exeter: Intellect Books, 2000).